Fly to Chiclayo on the Northern coast of Peru. 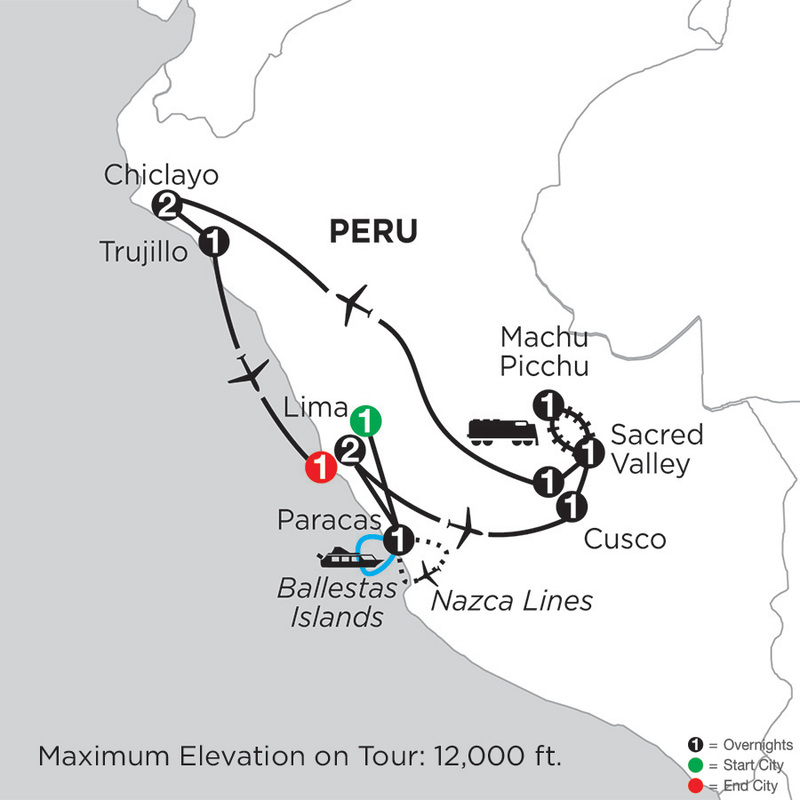 Chiclayo offers visitors a warm and sunny climate, expansive beaches, and beautiful colonial architecture. Upon arrival, you will be met and transferred to your hotel. En route to Trujillo, visit EL BRUJO, a Moche period stepped pyramid believed to be used for religious ceremonies between the 1st and 7th centuries. At the museum, learn about and see the artifacts found in the tombs. Visit the SUN & MOON PYRAMIDS, the largest pre-Columbian structures in South America, and hear how and why human sacrifice was practiced here. Continue to CHAN CHAN, a well-planned metropolis and ancient capital of the Chimu Empire. This archaeological site is characterized by very tall walls, some of which are 26 feet high, which enclose each of the 11 citadels. After lunch on Huanchaco Beach, transfer to the airport for your return flight to Lima. The Casa Andina Select Chiclayo is strategically located in the heart of Chiclayo. This comfortable and sophisticated hotel will welcome you and meet all of your travel needs. Its central location is ideal for those who want to enjoy exceptional museums and the archeological sites of the northern desert coast of Peru. Best of all, when not out seeing the sights, you can lounge by the pool, surrounded by palm trees, and enjoy the tropical sun. This 123-room hotel offers functional design and welcoming amenities with warm staff and all the comforts of home. Conveniently located in the heart of Chiclayo, it provides easy access to a variety of activities. By far the best hotel in the city, the Wyndham Costa del SolTrujillo is ideally located on the main plaza, with views of the cathedral and within walking distance of shops, restaurants and bars. All 79 guestrooms feature supremely comfortable beds and all the amenities you'd expect of a hotel. 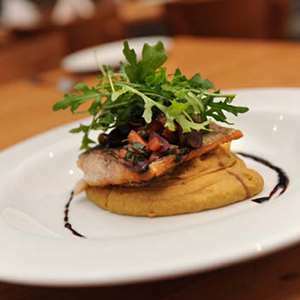 Bovedas Restaurant is the city's prime choice for an exquisite dinner, and Malabrigo Bar is a cozy spot, perfect to sip a cocktail and relax. A fully-equipped gym, sauna, and an outdoor swimming pool complement the days' activities. A dedicated staff will welcome you and attend to your every need. Situated on a privileged corner of the city's main plaza with a view of the Cathedral, the hotel is only a 10 minute away from the pre-Inca Chan Chan ruins and the Sun and Moon Temples. Monograms provides travelers access to a Local Host®, so you will have someone on hand to answer those vacation questions pertaining to Chiclayo. No waiting in line at the concierge desk or trying to ask your waitress at breakfast directions to the shopping district. Simply ask your Local Host about Chiclayo and you'll be on your way in no time. Plus, your Local Host will share local Chiclayo, Peru insights and share suggestions for getting off the beaten path, leaving you more time to create lasting vacation memories that are yours alone. My name is Johan Aguilar. I’m a knowledgeable guide in the North Coast and Highlands of Peru, with over 10 years of experience and excellent English. I’m very professional, kind, attentive, responsible and very careful with all visitors. I like to keep everyone happy during each tour. The city of Chiclayo is known for its traditional cuisine, and the best place to taste it is certainly Sabores Peruanos, a restaurant with modern infrastructure but with all the flavor of Peruvian food. 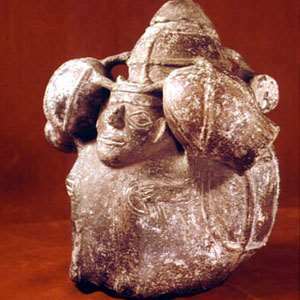 Located in Lambayeque, 40 minutes from Chiclayo city, the museum displays more than 1,500 pieces of various pre-Incan cultures, including a priceless collection of textiles and ceramics from Chimú and Vicus cultures. Thousands of gold objects are kept indoors, including copper funerary masks, ceremonial vessels, and extraordinary jewelry necklaces from the Mochica, Chimu and Lambayeque cultures. Monograms provides travelers access to a Local Host®, so you will have someone on hand to answer those vacation questions pertaining to Trujillo. No waiting in line at the concierge desk or trying to ask your waitress at breakfast directions to the shopping district. Simply ask your Local Host about Trujillo and you'll be on your way in no time. Plus, your Local Host will share local Trujillo, Peru insights and share suggestions for getting off the beaten path, leaving you more time to create lasting vacation memories that are yours alone. Designed by renowned artist Gerardo Chavez Trujillo, the museum attempts to show the evolution of the toy from pre-Inca to today. Visiting the museum will surely bring your childhood to mind. The famous Trujillano painter, Gerardo Chavez, settled in the outskirts of the city – a place of rest and relaxation and shows part of his artwork. Located in the city center, the Asturias Café is the most traditional cafe in town and the ideal place to enjoy the traditional "Asturian hotcakes" accompanied by a cup of hot chocolate. These are served starting at 5 pm.